Have you found anything great on Etsy lately? What kind of stuff do you like to buy/stalk there? How genius is that pencil shaving collar? that crystal ball necklace is so fabulous! 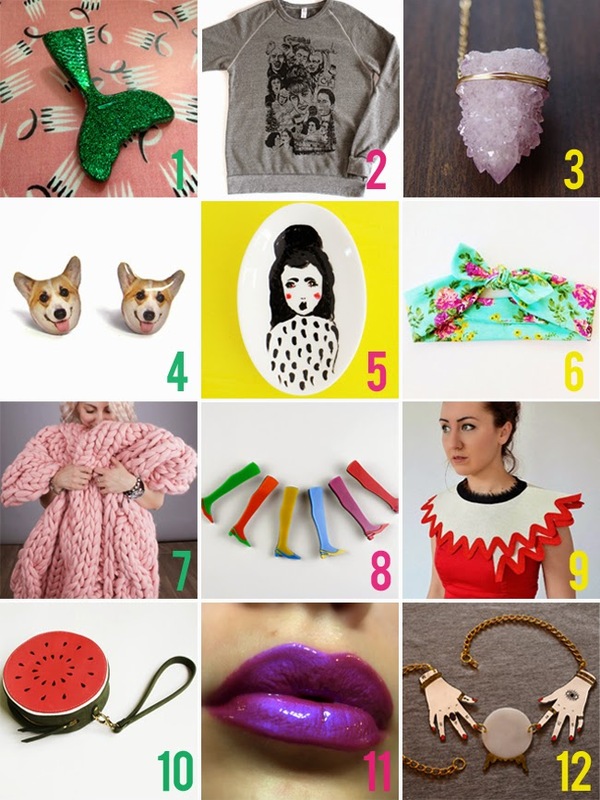 Love Etsy, that watermelon purse is the cutest! Happy Monday, darling!! Love Etsy! Are you on Etsy?! Would love follow you! I have an Etsy Store @whatwouldvwear! Get that holographic purple lipstick, girl!!!! That is so you!! omggg that purple lipstick. i know i would never be brave enough to wear it out but it's so gorgeous! Oh my gosh I'm in love with chunky knit blankets lately they're so amazing! Number 7 reminds me of the huge knit scarf Lenny Kravitz had on - so cosy! I just recently started shopping on Etsy and I'm completely addicted! This quartz necklace is so beautiful! it's amazing how much good stuff etsy has, love these! That chunky knit blanket is awesome!!! I want one, too! love that fluffy throw too!